All of Polanski’s early films create a breathing, creepy, fully fleshed out atmosphere; and this is no exception. I found that over two hours, I had slowly contorted my body into fetal position on the couch, without realizing it! This is impressive for a film that just turned 50. While it certainly shows its age in many regards, it creates one of the most tense atmospheres I’ve seen in a horror film, without relying on cheap scares. Most horror films owe a debt to this one for its influence. Polanski forge une intrigue folle, toujours d'actualité. Rosemary Woodhouse: "This is no dream! This is really happening!" Intriguing, plodding, extremely claustrophobic and anxious pregnancy thriller. It's one of the greatest ironies in the history of movies that Roman Polanski - convicted felon and who says that #metoo "mass hysteria", made one of the greatest feminist movies of all times. The infinite fear of losing control over your body and autonomy as a woman is embodied in a satanistic hyper-physicality. Farrow (another Hollywood irony) is raped, gaslight, abused and humiliated. By men, privately and institutionalized. For political and financial gain. 50 years before Kavanaugh. All the performances were off kilter and the direction was dreamlike and self aware. I wasn't into it for the first 30 minutes or so but at some point I got completely sucked in. 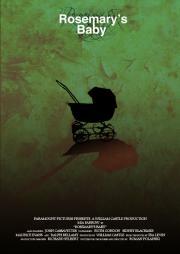 Rosemary's Baby is perfectly well acted, directed and is creepy enough. However it is very slow moving and drags in places. Mia Farrow carries the film with commitment and Polanski has an unquestionable style. To modern eyes, it's an uneven horror classic.